Maze-a-Pix puzzles can be played interactively on the computer, offering many features and advantages compared to pencil and paper. This section explains everything about how to play Maze-a-Pix on the computer. If you are not yet familiar with the puzzle rules, please go to Maze-a-Pix rules. 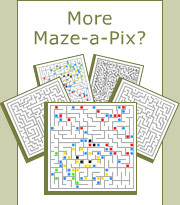 Maze-a-Pix interactive is played by painting a path from the entrance of the maze to the exit. To start painting the path, click mouse on the maze entrance and drag along the grid. To continue painting or to change the path, click mouse on the tip of the path and drag in the desired direction. To delete a path segment, double click mouse anywhere along the path. Click-ahead enables faster playing and reduces stress holding down the mouse button. To paint the path using click-ahead, click mouse anywhere between the tip of the path and the next junction. The path segment will be painted instantly. To continue painting the path, keep mouse button pressed and drag. Whenever deleting or going back on a painted path a gray trail is automatically created to indicate that the path segment has been painted before. Gray trails can also be created manually to indicate dead-ends or closed junctions. To create a gray trail, click mouse on an empty square in the maze and drag. To delete, double click mouse anywhere on the gray trail. Check the painted path for errors. Open How to play Maze-a-Pix page you are reading now.